The other possible subtitle of this story is: I have some good news and some bad news. Which do you want to hear first? 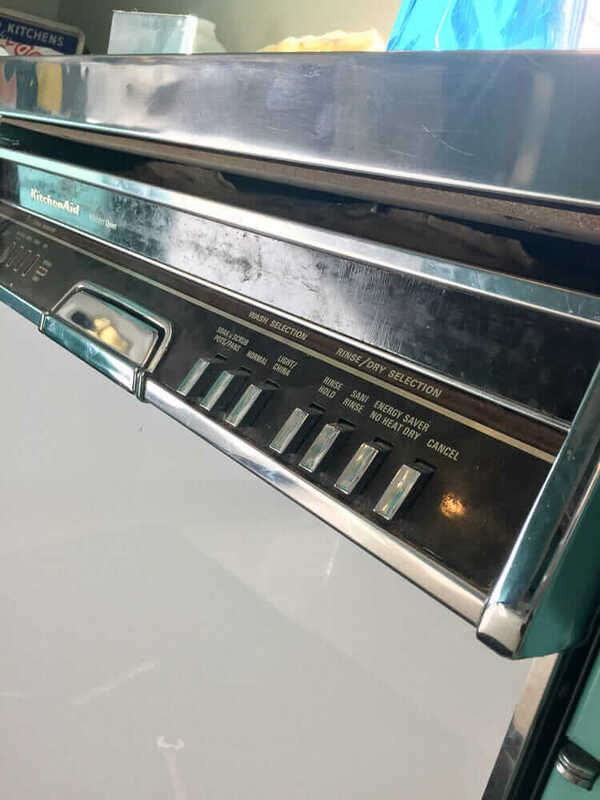 I have a new-to-me vintage Kitchenaid dishwasher installed in the kitchen! Woooooot! 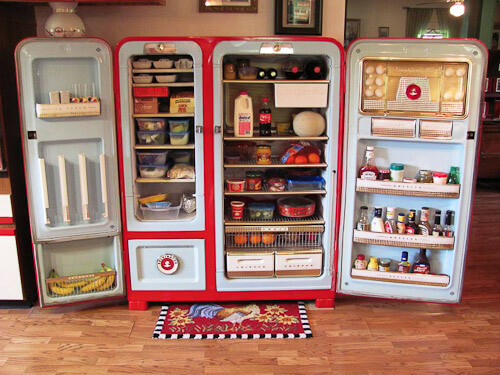 Needing a new dishwasher and disgusted by the short lifespans of current dishwashers, I turned to my tried-and-true method: Buy vintage. To research this topic, the automaticwasher “Imperial” forum was my go-to place. There are several of models that seem popular among the experts, including old Kitchenaid dishwashers still made by Hobart or using Hobart technology. These are apparently a DREAM in terms of longevity. And automaticwasher.org is a DREAM in terms of expertise! So fun! So I started regularly searching craigslist. Finally, I went for the pounce and recently, drove four hours roundtrip to buy this beautiful KDS-21 Kitchenaid Superba dishwasher. 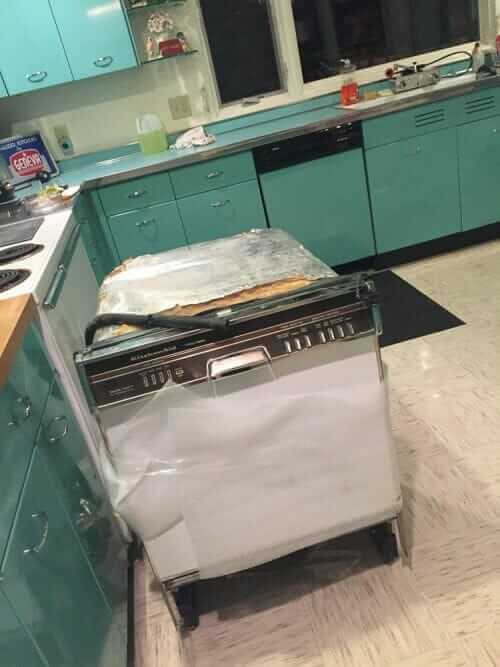 The dishwasher was in wonderful condition — the seller was remodeling. I also got two original booklets, a features-and-usage booklet and an installation guide. 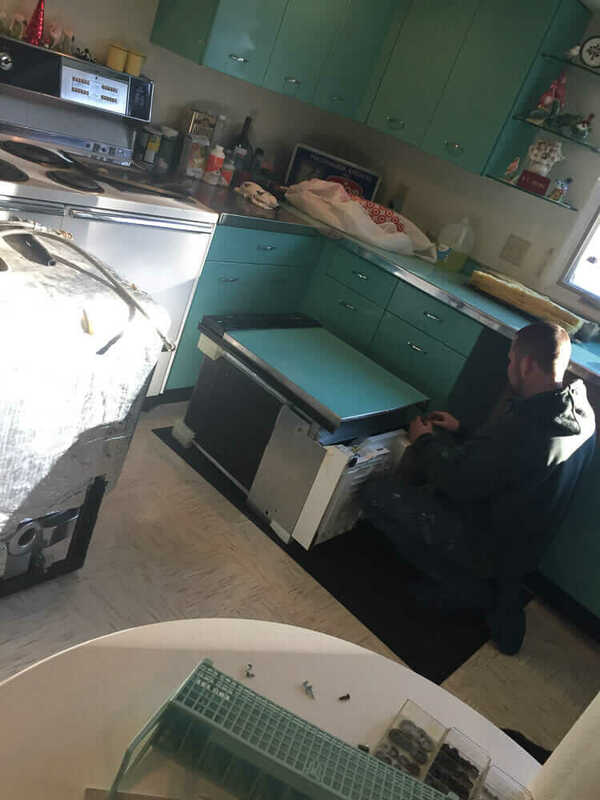 My plumber Paul — who also had installed my Dishmaster — came the same week I called and was a dream to work with in terms of getting the dishwasher into the space and all hooked up. She won’t turn on. We are sure there is electricity coming out of the plug. 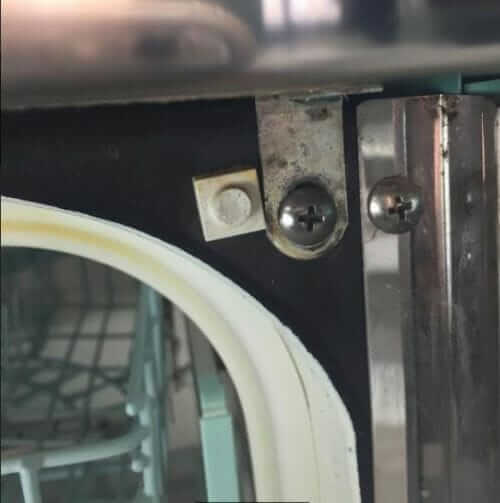 Mind the Gap: The plumber had to add wood supports to the bottom of the dishwasher to close the gap underneath my countertop. My floors are not level, so I recall that when we installed the cabinetry, the entire line of cabinetry along this wall had to be shimmed so that the countertop was level. The dishwasher has little adjustable legs on it that also can adjust the height. Even with those extended to their fullest point, we had a 5/8″ or so gap. Yes, I need to detail clean the dishwasher’s exterior. Before I try and find someone locally who can help get my darling Kitchenaid going, I will be reaching out to automaticwasher for help. Midmorning update #1: The folks at automaticwasher responded immediately to my “Damsel in Dish-tress” post on their site. Within the hour, “toploader” asked me if a “white rubber pointy thing” was where it should be, providing more info. 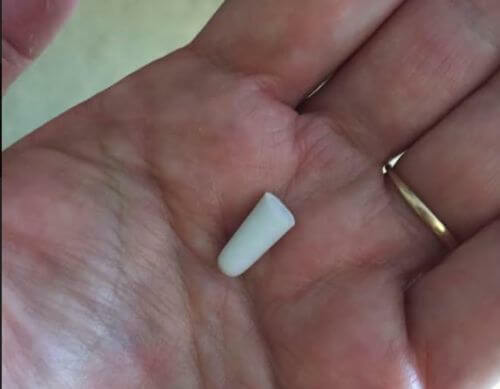 Well golly, wouldn’t you know it, but indeed, a little white rubber pointy thing HAD popped off the dishwasher at some point early on, and we couldn’t figure out where it had come from. Fortunately, I had saved it. And even more fortunately, I put it somewhere where I found it. So now I need to glue it back on. It’s some kind of sensor trigger or something — when you close the door, the white rubber pointy thingy presses a metal thingy. Maybe this means “the door is really closed”? I don’t know. I also heard from another helpful automaticwasher-er where I could get a replacement if the glue does not hold. Another reason I went for this particular Kitchenaid model: The front panels can be changed out. 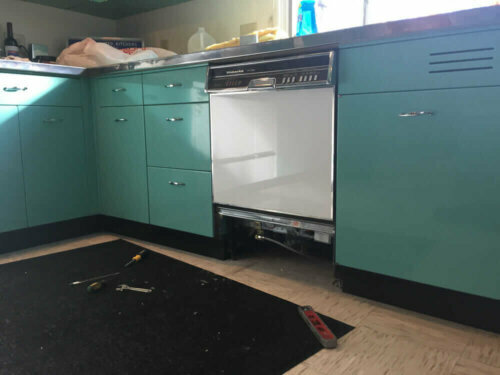 I plan to swap out the white plastic (yes, that’s a sheet of some sort of plastic) for the aquamarine-colored steel panel on my old dishwasher. The steel for that panel was taken right from the side of an extra kitchen cabinet from my salvaged set. I will have to have the current one-piece panel cut into two-pieces to size — one for the door, one of the bottom plate (see top photo to see the KDS-21 with both cover plates). Interestingly, I am not particularly annoyed by how this played out — update: is playing out. After all, around here we do things The Hard Way. 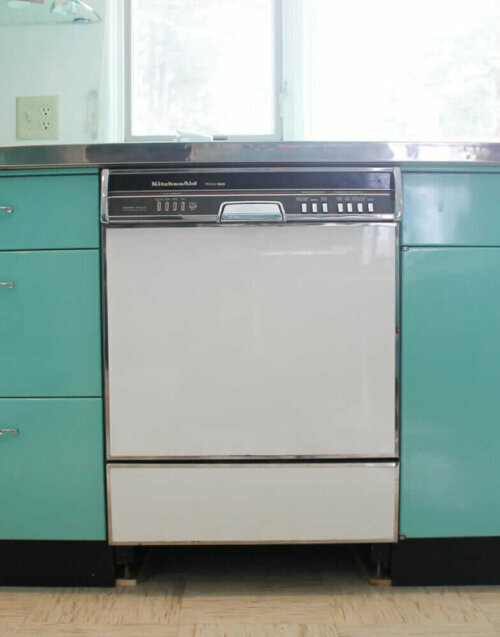 And even sans suds, I give this project “three steps forward” because golly, my vintage Kitchenaid dishwasher is so pretty. So collectible. So substantial. And assuming I can get her working: A proven workhorse! UPDATE: See my followup video — my dishwasher works like a charm! 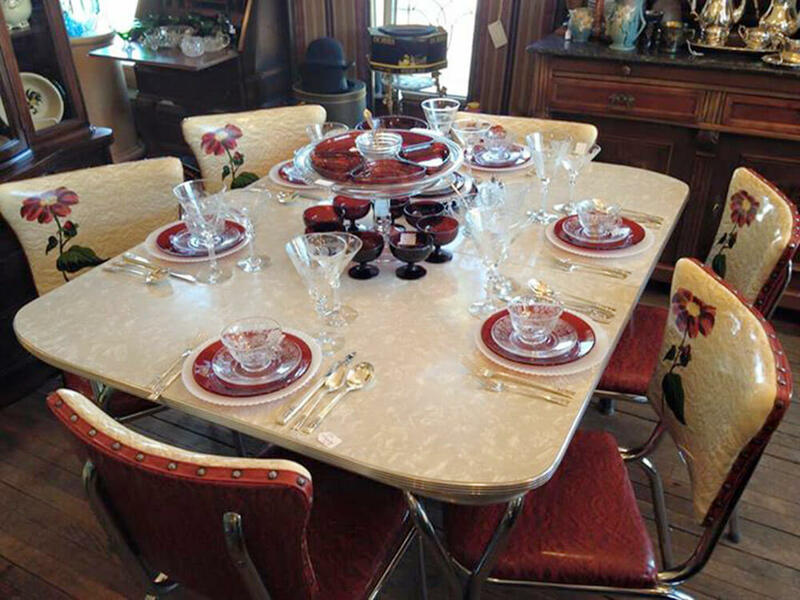 Interviewed by the Washington Post about TV tray tables … What do you think of these oldies but goodies? Hey I’m not sure if you know this but the colors can be changed. 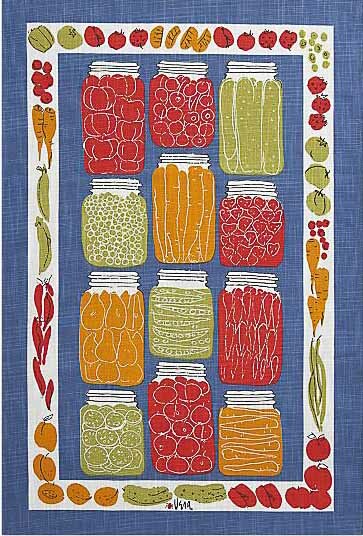 There are panels upper and lower that are reversible hidden under the existing panels. Remove the right chrome escutcheon along the door and bottom panels. Slide out the aluminum panels. Hope that helps.